Rainshade Alice Blue Gown was one of our most beloved Collies. We fondly referred to her as “Nurse Alice”, because she protectively watched over children, family members, and friends whenever they felt sad or ill. Alice was always very concerned about everyone. If you were stuck in bed with the flu, you could bet that Alice would always be within two feet of your bedside, ready to fetch whatever you needed, and to offer you unlimited comfort. Alice is one of the foundation pillars of Rainshade Collies. She is full sister to International Champion Ringleader Blue of Rainshade and the dam of many influential Rainshade Collies. Alice is the granddam and great granddam of many Rainshade title winners: champions in conformation and titled in obedience, agility, and herding. In addition, our many Rainshade therapy, service, and working Collies trace back to Alice. Rainshade Alice Blue Gown is the dam of Rainshade Sans Souci and Rainshade Noblesse Oblige (both exported to Australia and both produced champions in Australia) and Rainshade Rhapsody in Blue (exported to France). 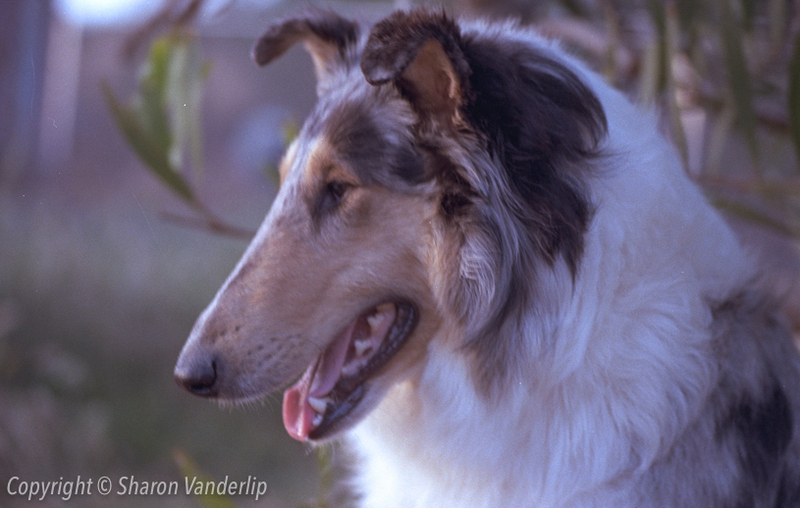 During her very long, happy life, Rainshade Alice Blue Gown helped and enchanted many people and contributed greatly to the quality of Collies in both hemispheres of our world.